Have a kiddo that loves to play with model vehicles? Or maybe wants to learn a little more about them? 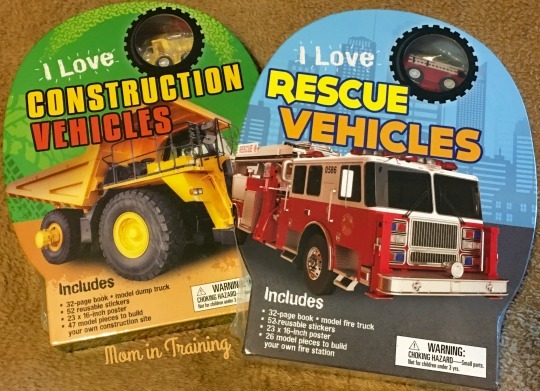 Then I have the perfect thing for you, I Love Construction Vehicles and I Love Rescue Vehicles play sets. They each come with one model vehicle and a fun fact book to go along with them. Plus they each have model pieces to build a place to play wit them..now what kiddo wouldn't love that? I know mine sure did when these arrived. As a mom I like that they get to learn while they play. And the box they come in doubles as a play center for the vehicle and model set.